Former councilmember to speak at installation on Jan. 28. The Honorable Jan C. Perry will be the guest speaker at the Little Tokyo Business Association’s (LTBA) Shinnenkai (New Year’s celebration) and Installation Dinner on Thursday, Jan. 28, at 6 p.m. at the Miyako Hotel, 328 E. First St., Los Angeles. “We are delighted to welcome Ms. Perry back to Little Tokyo at a time when our community is experiencing rapid growth and facing the challenges accompanying that growth,” stated Ellen Endo, LTBA president. For more than a decade, Perry represented Little Tokyo and most of Downtown Los Angeles as a member of the Los Angeles City Council. 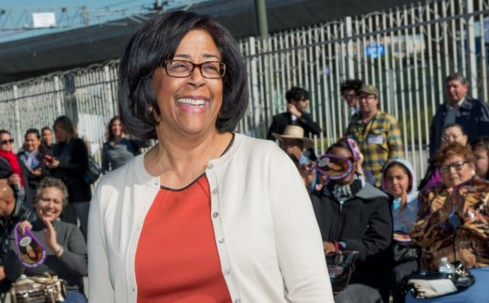 While in office, she helped spearhead projects such as L.A. Live, Our Lady of the Angels Cathedral, and the new Police Administration building. Perry’s pivotal role in the revitalization of the Downtown area led Mayor Eric Garcetti to appoint her to head the city’s Economic and Workforce Development Department, overseeing 180 employees and 18 Work Source Centers offering specialized training, resume development, and a number of career development services. Last July, Perry received the Order of the Rising Sun, Gold and Silver Rays, for her efforts to preserve and promote Japanese culture and Japanese American history. On Jan. 21, Endo was re-elected president of LTBA for a third consecutive term along with the new, 35-member board of directors. LTBA’s beginnings date back to the early 1900s, and the organization was incorporated as a 501(c)(4) nonprofit in the State of California in 1959. Reservations for the installation dinner may be made by email at [email protected] or calling (818) 512-8791. Online reservations at $55 per person are accepted here.